Earlier this winter, I was driving a truck for a living. Now, I’m first in the world standings among team-roping headers. Honestly, it’s been miracle year. To explain why, let me give you a little background. 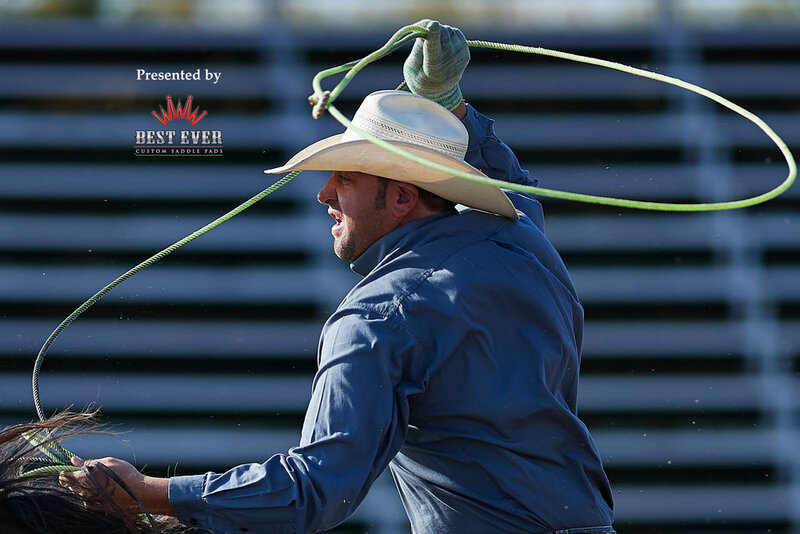 I joined the PRCA in 2003 and came close to making the National Finals Rodeo several times during those early years. In 2009, all I had to do was catch my steer at Pendleton and I was in the NFR, but I broke the barrier. I came back strong in 2010 and made the National Finals with Cody Hintz. I didn’t have a great NFR, but it was a big lesson in how to rope at the Thomas & Mack. In my mind, after coming close so many times and then finally making the Finals, I figured I wouldn’t miss again. In 2011, Cody and I had a phenomenal winter. At one point, we might have been winning the world. After that I didn’t win a check until Vernal, Utah. In the middle of July. My head horses all went crippled. I didn’t have the money to go buy another one. I mean, it was just one thing after another. I finished 2011 in 21st place. The next year, I was 18th. The year after that, 23rd. The year after that, 20th. I just could not make the NFR again. Around 2015, I said, I’m done. I’m sick of being broke. I’ve got two little girls. I’m just gonna work. I started driving a truck. Then I bought four trucks and put drivers in them, but that didn’t work out like I had hoped. I got rid of all but one truck and was still driving here and there this winter. It was the only way I knew of making a living. But not rodeoing was killing me. I knew I had the talent to get to the NFR. I was dealing with other life changes, too. In June of last year, my grandmother passed away. She and my grandpa started our family ranch in Ramah, Colorado. She had a great life, a tough life. She was ninety-seven when she died. I never got to know my grandpa. I was too little when he died. But my grandmother and I were really close. I was more like a son to her. No matter what, she always had my back. And then last fall, my wife and I began divorce proceedings. I needed a change of scenery, so I moved to Casper, Wyoming. Different people stepped into my life and helped me, including Kendra Martin and her parents. I started roping with Jhett Johnson and his family. I’ve known the Johnsons all my life. The only header in that family these days is Jhett’s son, Kellan, and he went off to college. Everybody around there was heeling, which worked out great for me because I got to head as many steers as I wanted. I went up to Wyoming to get away from stuff and just rope and rope. That’s what I did. I started working out. I roped every day. Stuff started happening. I could feel a fire building up in me. I thought of my grandmother and how hard she worked. She was there in Las Vegas when I made the National Finals in 2010. I made up my mind that I wanted to make the National Finals again. I wanted to rodeo. The 2019 season started off a bit weird. I was roping with a buddy. We decided to enter the qualifier for the National Western Stock Show & Rodeo in Denver. I’ve never entered the qualifier, because I always got in. I thought, Well, even though it’s the qualifier, it still counts for money won. We went. I missed the first one. My partner missed the second one. We didn’t get into Denver. My buddy decided he didn’t really want to rodeo. So there I was with this fire built up in me and no partner. A buddy of mine, Trevor Schnaufer, and I decided to enter the rodeo at Rapid City, South Dakota, at the end of January. We split fourth and fifth and took home thirty-three hundred dollars each. I drove all night from Rapid City to Texas for the San Angelo Rodeo. I got there just in time to rope. At San Angelo, I was heading with a different heeler, Brandon Bates. In the first round, we were 3.9 and won fourth place. We made a decent run in the second round. In the short round, we were 4.2 to place first. We ended up winning second in the average. Heck, I won nine thousand dollars in San Angelo. It wasn’t even March, and I had a total of sixteen thousand won. But at that point, my horsepower wasn’t good, and I didn’t have the money to buy another horse. At San Angelo, they take the average champions to Rodeo Houston. That’s the last way you can qualify. Aaron Tsinigine and Kyle Lockett won San Angelo, but because Aaron had done good enough last year to make Houston, they took the header who won second-place at San Angelo. That’s how I ended up getting into Rodeo Houston this year. At Houston, Aaron was entered with Walt Woodard, so Kyle Lockett and I decided to partner up. I’ve known Kyle forever. He’s one of the greats. I remember watching him and Wade Wheatley at the National Finals when I was a kid. I idolized him. But we had never run a steer together. Kyle and I were in Super Series #4 at Houston. I ran the first three steers on a yellow horse I borrowed from Laurie Mills of Casper. He felt a little green, but it worked out. We placed in the first two rounds and won the third. For the semifinals, I decided to ride my old horse, Blackie. I have a long history with Blackie but had a buyer for him lined up after Rodeo Houston. I was gonna sell him for not a whole lot of money. Blackie performed great during the semis. Me and Kyle moved on to the Top Four. In the Championship Shootout, we were third out. We drew the same steer we won the Super Series round on. I caught him, the steer set up, and Kyle pulled an amazing shot to heel him. We were 5.0, which was good enough for the win—$50,000 each, plus our round money. That’s the biggest purse I’ve ever won, so I bought that steer. I figured it would be cool to have him around back in Wyoming. I decided not to sell Blackie. And I bought Laurie Mills’s yellow horse. His name is Walt. I’m hoping he can be my number one this summer. Did winning that big check help me? Yeah, it helped a lot. It helped me catch life up to where I don’t have to worry about where I’m going to work tomorrow. I can say, Okay, I’m gonna rope every day. It’s been exciting. It’s only April, and I already have more than seventy-thousand won. I haven’t had this kind of opportunity in a long time. If everything goes as planned, I’ll be roping for $26,000 a night come December.